Crafting it Forward: Teach compassion to your kids! You are here: Home / Fine Art / This is an amazing way to teach compassion to your kids!!! This is an amazing way to teach compassion to your kids!!! I have just discovered one of the coolest ways EVER to teach my kids compassion and empathy towards others! 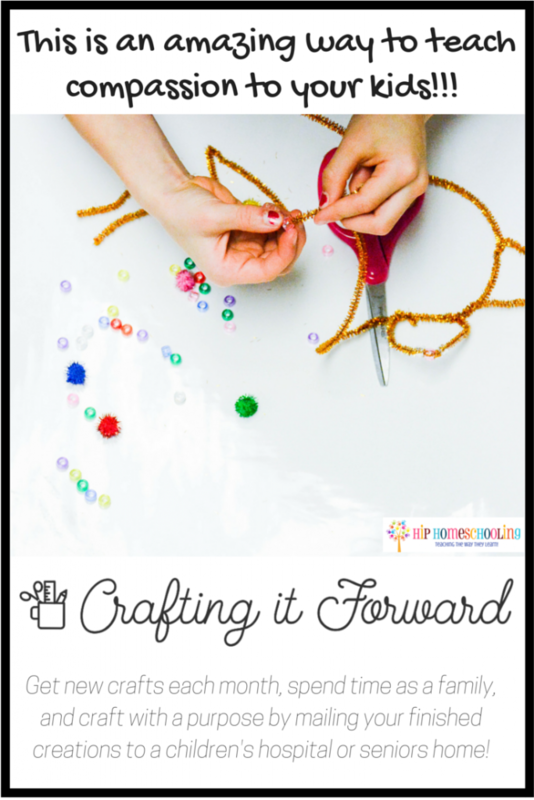 I am so excited to introduce you to Crafting it Forward! Crafting it Forward is a monthly subscription box with everything you need to make a fun craft! That in itself sounds fun enough to capture my interest! However, it doesn’t stop there! Inside your box you will also find an address label to a children’s hospital or senior’s center so that someone else can enjoy the craft your kids have made! Wait a minute, let me get this straight???!?!?!? You get to make a fun craft and then bless someone else with a RAK (random act of kindness- it’s all the rage right now)? That’s right! How much cooler can you get? Check out what we made below and how you can get your hands on this amazing product! Crafting it Forward: How it works. 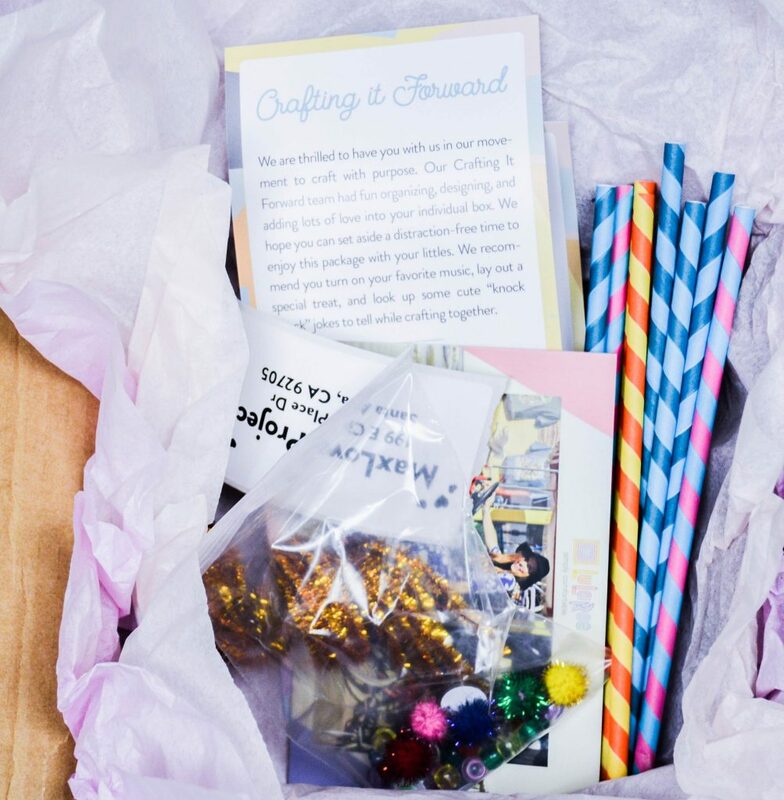 The craft box that you will receive includes your instructions and supplies, everything you need to get started! It is specifically targeted for 3-7 year olds, though our whole family enjoyed the experience because we knew where it was going afterwards. You will receive supplies to make two crafts each month. At the top of your card you have a website and passcode to visit to see what you need to do. Their tagline is “crafting with a purpose” and it is the perfect description! What it comes down to is that this is a business all about love. It is something you can believe in and get excited about each month! It helps build family relationships with intentional family time for a greater cause! You can use your crafting time to think about the child or elderly person that will be receiving that craft. Instil empathy in your kids by talking about what it would feel like to be alone and sick and how that person will feel when they see what you are sending. You can write a little note about yourself or encouragement card and send it with your craft. What’s not to love about this program? Crafting it Forward: The details. In our month box, we had the supplies to make a crown using pipe cleaners, beads, and pom-poms. We also had supplies to make our own adorable little puppet theatre. We had exactly what we needed and the instructions were thorough with lots of pictures and even an estimated time so we could plan it into our school day. Before we sent it out, the kids put their name on the card that came in our box. We also received a bonus LuLaRoe pair of tights. I had never heard of those before, it was a super fun surprise to see that in the box and they are so bright and fun, my perfect colors! I guess they are now my official “crafting pants”. I told the kids whenever I wear them it means it’s crafting time ;). As a bonus… they are by far the most comfortable pair of tights I have EVER worn! Wowsa! I am so beyond impressed with this program. It is something I could believe in! This would be the PERFECT gift for grandma and grandpa to buy as a birthday present for the kids, so make sure to forward this review to them (with a little hint hint nudge nudge). You can buy your box on their website at craftingitforward.com. You can also find them on Facebook and Instagram. So even if you can’t add a subscription to your budget right now, make sure you send them some support with a like or follow so you can stay up to date on what’s happening! Had you ever heard of Crafting it Forward?